TCS is a proud supplier of Tuffy Range. 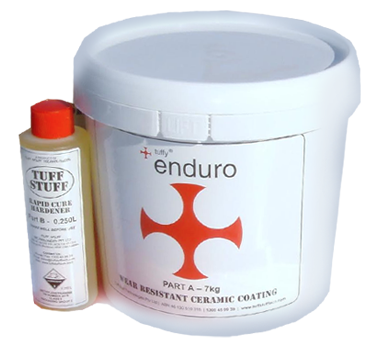 Tuffy Enduro is a trowellable wear resistant ceramic coating, which comes in a two-part system comprising a 7kg pail and a bottle of hardener. Enduro is a perfect all-purpose solution to a range of wear problems. You can use this one horizontally or vertically to protect, repair, and fill against abrasion. Tuffy Enduro is a fast setting ceramic repair kit that comes with a Rapid Cure hardener and is best suited for cooler climates. The two part system can be used in a wide range of both wet and dry applications. The kits are easy to unpackage, easy to mix and come with a steel scraper, mixing board, and nitrile gloves.